Mobile phones are no more objects of luxury and are now among the list of necessities, thanks to the communication network boom in this Globalization era. Other than being used as social and professional communication tools, these gadgets have been put to use in health care services in fields like tele-diagnosis and SMS reminders for vaccines and treatment adherence. The mobile phones used in environments posing risks of bacterial contamination such as slaughterhouses, hospitals, toilets and animal facilities could very well be used in places that require germ-free environment such as food handling areas or intensive care wards. The problem with these mobile phones are that, hand washing may not be performed often enough after using them and most people use them in the course of working day and these handsets are seldom cleaned either. Yet, they are used very close to our face near mouth, nose and ear. Compared to other fomites, effective disinfection of mobile phones is challenging and that they have access even to our dining tables. A recent study has reported in a dramatical way that, "the average mobile phone is dirtier than either a toilet seat and bottom of your shoe". Various studies have been undertaken to study the carriage rates of mobile phones handled by health-care workers (HCW). 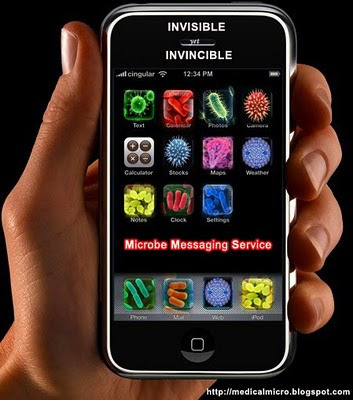 Though well planned infection control plan with proper hand hygiene, environmental decontamination, surveillance and contact isolation is effective, colonization of objects handled by HCW particularly the mobile phones pose a grave problem. A study conducted in Turkey evaluating the role of mobile phones in relation to transmission of bacteria from mobile phone to HCW’s hands, revealed an alarming rate of bacterial contamination of mobile phones as high as 94.5%. 49% of phones grew one bacterial species and 34% two different and 11.5% three or more different species. A recent study from India screening 160 mobile phones belonging to healthcare personnel for bacterial isolates has reported coagulase negativeStaphylococcus aureus as the most commonly isolated bacterium followed by Staphylococcus aureus and E.coli. Isolation of MRSA and Acinetobacter spp. from the mobile phones of HCWs is obviously an issue of deep concern considering the clinical implications of a nosocomial spread. Frequent decontamination of mobile phones used by health care workers with 70% ethanol swabs and strict restriction and prohibition of mobile phones of visitors into hospital wards and intensive care units could possibly bring down the grim risks of spread of nosocomial infections. Also, in case of mobile phones used by general population, it is always a good practice to decontaminate them periodically and care should be taken to have them out of reach of babies and younger children.